Commentary by director John Llewellyn Moxey. Commentary by actor Christopher Lee. Interview with John Llewellyn Moxey. 2 minutes of footage deleted from the U.S. version. DVD cover printed on both sides with two different cover designs. 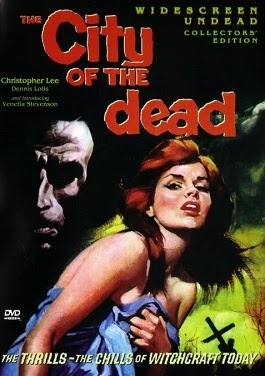 "City of the Dead" (released in the US as "Horror Hotel") is an atmospheric occult thriller that overcomes its sparse budget with creepy photography and lighting, good performances by most of the cast and an economic running time which leaves very little time for the audience to lose interest. Christopher Lee stars as Professor Allan Driscoll, a college professor teaching a class in the history of witchcraft. What happens when his beautiful blond student, Nan Barlow (Venitia Stevenson) travels to the New England town of Whitewood for a research project? The film opens in Whitewood as Elizabeth Selwyn (Patricia Jessel) is burned at the stake in 1692. As the crowd of puritans gather round to watch, her lover, Jethro Keane (Valentine Dyall) stands at the back calling on Lucifer to help the burning witch. Lucifer answers Jethro's prayer. Elizabeth feels the presence of the dark master and curses the town. May they forever live under the curse of Satin. Flash forward to modern times. Professor Driscoll is relating the story of Whitewood. Nan is fascinated by the subject. She wants to do further research. Professor Driscoll gives her the name of the woman who runs the Raven's Inn in Whitewood. Nan's boyfriend, Bill (Tom Naylor) is against her going, as is her brother Richard (Denis Lotus), a colleague of Professor Driscoll's. However, Nan is headstrong and will not be deterred. Once in Whitewood Nan realizes that the town's people are not quite normal. The village looks as if it stayed locked in the 17th century. What Nan doesn't realize is that once a year, on Candelmas Eve, the townspeople must sacrifice a human and drink their blood in order to continue to live for eternity. Like another movie from 1960 (Psycho), "The City of the Dead" has its heroine meet an early demise in a small town hotel. "The City of the Dead" actually pre-dated "Psycho." The remainder of the movie concerns Richard and Bill trying to locate Nan. The plot has many more twists and turns which I will leave to you to discover. This was the feature film debut of John Moxley. Actually it was one of the few theatrical feature films Mr. Moxely directed. Moxley went on to become one of the most prolific television directors of the last 40 years. He also directed "The Night Stalker." "Foster and Laurie," and the original TV pilot film "Charlie's Angels"! What Mr. Moxley lacked in budget on "City of the Dead" he made up for with the best use of mist you will find in any genre movie. Moxley direction is the reason that "City of the Dead" works so well. My 15 year old daughter has become very jaded (despite my best interests) about watching black and white films. She watched this movie alone and didnâ€™t want to sleep that night. Iâ€™ve allowed her to see many more graphic horror films. I was surprised that this little gem from British Lion films cut through her veneer and scarred her. Maybe she is starting to appreciate movies for more than the special effects. "The City of the Dead" is a spooky movie perfect for a late night on the couch with the lights out. Excellent extras, very good movie, good sound. Worth the price of admission. Further proof that VCI is working hard to become a leader in the DVD market. While the major studios are releasing older movies with little or no extras, VCI is running the extra mile to produce top notch interviews and commentary tracks for some great films. The fact that VCI isn't a major studio with tons of archived material at their fingertips makes this achievement all the more amazing. There are folks out there like myself who appreciate this. The great atmospheric black and white photography looks as good as it did back in 1960 thanks to a great restoration job aided by British Lion Films. It's mono. It sounds good, but it sounds a little flat in comparison to modern surround sound tracks. Great design with the emphasis on creepy! Easy to navigate. Animated menus. One of these days, I hope to be able to interview Christopher Lee. He is my all time fantasy and horror film actor. This disk is a God send for Christopher Lee fans in that you get a 45 minute interview which is excellent. The interview rocks because there is minimal input from the interviewer and more of Mr. Lee talking about his career. You also have a commentary track by Mr. Lee. The commentary track by director Moxley is also quite good. His interview (30 minutes) is hit and miss. I wish there had been more time devoted to his long career. OK interview with Venitia Stevenson. She is still hot 40 years later. The trailer and photo gallery are good. I love the dual sided DVD cover. I couldn't find a JPEG of the reverse side to illustrate the review. The reverse side is a sordid "pulp magazine" type poster of a beautiful woman in danger. Very cool period artwork. A must have for Christopher Lee fans. I recommend the purchase of this DVD to show VCI that their efforts to meet the DVD needs of fans of older films are being appreciated. No company I know of puts such an effort in the production of older film DVDs. More extras than some major studios put into their new release disks! Also see VCI's "The Mark" for an example of this dedication to movie fans.